When you are looking to buy a princess cut diamond you always need to keep in mind the quality you want. There are a couple of important factors to consider, but whatever your preferences are it is always essential to make sure the diamond you are looking at has a valid certificate, issued by a well known and respected lab. IGI, HRD and GIA are among the labs with the best reputation and we can recommend to select a stone that has a certificate issued by one of these labs. Furthermore, on our site we preselected the diamonds that offer the best qualities for colour, clarity or cut so that you are assured of a good purchase no matter what diamond you select. Buying a princess cut diamond can be overwhelming. You have a variety of possibilities to choose from once you begin your search. If you like to purchase a princess cut diamond for less money you will have to carefully research and make the right choices. If you are looking to design your personal diamond engagement ring or other diamond jewellery you need to choose a stone which fits your individual taste. All these 4 qualities affect the look and pricing of your stone and must be considered when selecting your loose certified diamond. Diamond Cut : This characteristic determines the brilliance or shine of your diamond. A diamond wrongly cut will look dull and unattractive. Diamond Color: The colour of a diamonds represents the amount of colour present in the diamond. Colourless diamonds are graded with a D, the more tints of yellow colour present in a diamond the higher the grading will be. Colourless or white diamonds are the most precious ones. 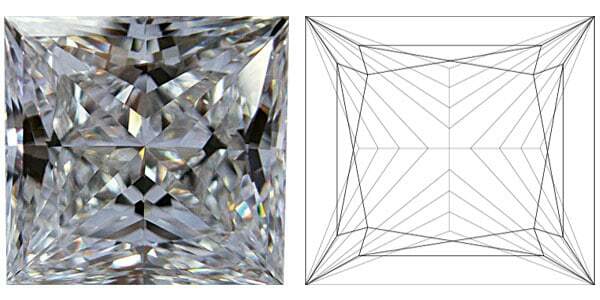 It's very important to understand the different facts of diamond grading before you select your princess cut diamond. We advise you to visit our Diamond Learning Center to learn our more about certified diamonds, diamond characteristics and quality. Antwerpdiamonds.direct is located in Antwerp, Belgium in the middle of the diamond quarter. Originally focussed on b2b we decided to also offer b2c customers the opportunity to get a stone at the same conditions and qualities as a retailer. You have chosen to buy a princess cut diamond ? Buying a princess cut diamond or any other type of diamond is always a special occasion. It is not only an expensive purchase, but you are getting something unique and valuable that will last a lifetime. Feel free to Contact Us with any questions you could have about diamond qualities, buying certified diamonds or choosing your own loose diamond. We are happy to answer any of your issues or assist you find the diamond that fit your specific needs.